John Moran Auctioneers is pleased to present an important assemblage of Continental and Asian art and objects from a variety of local Southern California estates and collections in their July 17th Traditional Collector catalogue. The 400-lot catalogue includes an especially diverse selection of French, Swiss, English and German clocks dating from the 18th through the 20th centuries, many from the estate of lifelong collector Harry J. O’Connor III. The O’Connor estate has also proffered furniture, fine art, Asian antiques, and other decorative items sure to appeal to serious collectors. Timepieces from the O’Connor estate include a number of fabulous Continental clocks in a variety of motifs. A French gilt and patinated bronze mantel clock signed for 18th century maker Brindeau features a patinated bull (Zeus disguised) supporting a gilt rocaille-molded clock case; three maidens (Europa and two attendants) adorn the bull with flowers and garlands. The mythologically themed clock will head to the block with a $5000 to $7000 estimate. A French Empire gilt bronze-mounted marble portico clock marked for turn-of-the-century maker Sarton à Liège is an intriguing find, as it features inset Wedgwood-style plaques to each vertical support (estimate: $8000 to 12,000). A cased 19th century John Bliss & Co. nautical chronometer clock is slated to head to the block with a $2000 to $3000 estimate. A later example by Swiss maker Gubelin features well-modeled mounts in the Louis XVI taste, and is sure to exceed its conservative $6000 to $9000 pre-auction estimate. A handsome George IV sterling silver lidded urn by makers Rebecca Emes and Edward Barnard features a personal inscription to the Reverend Edward William Stillingfleet B.D. from the parishioners of Hotham in the County of York dating to 1839 (estimate: $2000 to $3000). An exceptionally finely carved Chinese jade sculpture of a head of napa cabbage will make a fun addition to any collection; the lightly colored jade carries a conservative $800 to 1200 estimate. A delicately painted French 18K gold enamel vanity box will make its way to the block with a $1500 to $2500 pre-auction estimate. Moran’s Traditional Collector catalogues generally include a selection of Continental paintings by artists both well-listed and unknown– highlights from the former category in the July sale include a “Cathedral Town on the River”, a sweeping, picturesque townscape by British painter Albert Goodwin (1845-1932) dating to 1871 (estimate: $8000 to $12,000). John Frederick Herring, Jr. (1815-1907 British) is represented in Moran’s July 17th catalogue by a charming pastoral view horses watering before a group of thatch-roof cottages. Consigned from a local Pasadena collection, the Herring is estimated to bring $15,000 to 20,000. French artist Édouard Léon Cortès’s (1882-1969) charming street scene, “Rue Royale at Dusk”, carries a $20,000 to $30,000 estimate. Moran’s has also been pleased to offer select works from Armenian watercolorist Yervand Nahepetian (1916-2006) over the last calendar year. For the July Traditional Collector catalogue, Moran’s will offer a pair of exceptionally detailed works; one showing an interior view of a mosque with figures, and the other an interior of a rug market. Each work by the artist is expected to bring $1500 to 2000. Asian art and objects will also carve out a presence in Moran’s July Traditional Collector catalogue. A fabulous pair of Chinese carved hardwood armchairs dating to the late 18th/early 19th century feature relief-carved backs with flying dragons and are sure to excite serious collectors; the estimate for the pair is $20,000/30,000. An impressively scaled Chinese painting depicting gods, goddesses and their various attendants dating to the turn of the 18th century carries an $8000/10,000 pre-auction estimate. A wide variety of silver by makers from the US, Europe and Asia are slated to make their way to the block at Moran’s July sale. One of the most impressive silver lots in the catalogue is undoubtedly a silver Spanish galleon/warship dating to the mid-20th century. 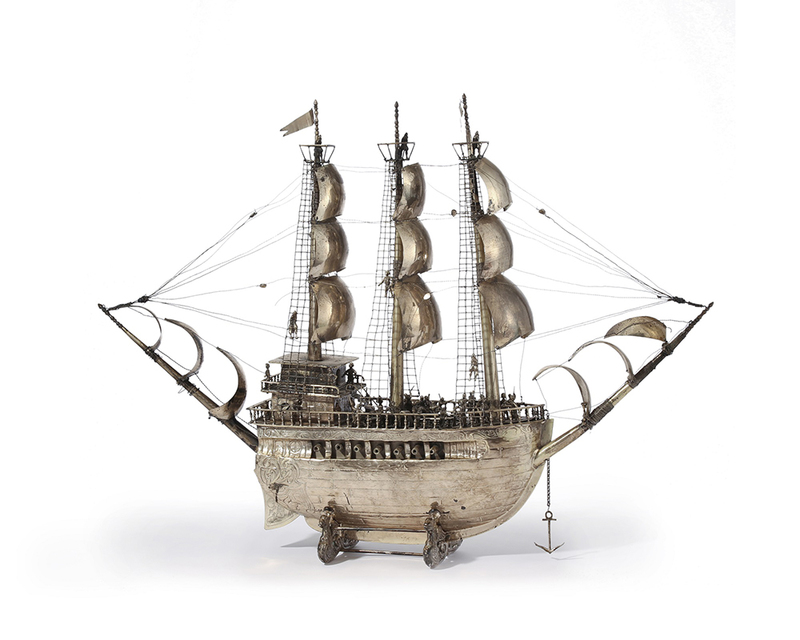 Consigned by a private Pasadena, CA collector, the three-mast ship features delicately modeled cannons, sailors and sails, all crafted from .915 silver (estimate: $5000 to $7000). A repousse-decorated sterling silver dragon-motif teapot by Yokohama-based silversmith Samurai Shokai is highly collectible and offered for $2000 to $3000. A Victorian sterling silver Monteith dating to 1889 and stamped for maker Walter & John Barnard is expected to earn between $4000 and $6000. Sculpture highlights include works in bronze and marble by well-respected continental artists, such as a nicely finished marble sculpture of a standing woman with a shield, helmet and sword by French sculptor Henri Honoré Plé (1853-1922) (estimate: $4000 to $6000). “Bakie”, an Orientalist bronze bust of a young woman with definite Art Nouveau influences by Georges Charles Coudray (1863-1932 French), is sure to appeal to collectors with a conservative $1000 to $1500 estimate. A nice selection of French and German art glass and porcelain dating from the 19th through to the early 20th century also proffer a number of intriguing highlights, including two animal-motif vessels by French maker Lalique. A Rene Lalique “Perruches” bowl in opalescent glass dating to circa 1931 is offered with a $2000 to $3000 estimate. A more contemporary example, a Lalique “Biches” vase in rarely seen violet glass has been assigned a conservative $600 to $900 estimate. A handsome pair of Sevres-style gilt bronze-mounted porcelain urns have been assigned a $3000 to $5000 pre-auction estimate, and each feature finely painted decoration of Venus and putto among billowing clouds. A small curated selection of Meissen figural groups will be offered at Moran’s July sale, including a large “Apollo and Daphne” figural group originally modeled by Johann Carl Schönheit after the life-size marble sculpture by Italian artist Gian Lorenzo Bernini (1598-1680), which will head to the block with a $1000 to $2000 estimate. An impressive gilt bronze-mounted mahogany baby grand piano by Alois Hugo Lhota will be offered with a conservative $15,000 to $25,000 estimate. A French-made Aesthetic-design Japonesque armoire with mother-of-pearl inlay and bronze embellishments is expected to bring between $3000 and $5000. A large-scale Japanese bronze urn with finely modeled dragon’s head handles and relief-decoration of birds in prey and pine branches will head to the block with a $2000 to $3000 estimate. A large French double singing bird automaton in good working condition is a rare find and is offered for $3000 to $4000. Free public preview is scheduled for Friday, July 13th from 10am to 4pm; Saturday, July 14th from 12pm to 4pm; Sunday, July 15th from 12pm to 4pm; Monday, July 16th from 10am to 4pm; and on Tuesday, July 17th, the day of the auction, starting at 10am. The auction will start promptly at 3pm. The fully illustrated catalogue will be live online by June 28th, and bidding will be available via the Liveauctioneers, Auctionzip and Invaluable online platforms, as well as in person and via absentee and telephone bid. John Moran Auctioneers has already set their auction calendar for the remainder of 2018. Upcoming events include: August 21st Studio Decorative and Fine Art auctions, September 12th Women in American Art, October 23rd California & American Fine Art, November 13th Prints & Multiples and 20th Century & Contemporary Art + Design auctions, December 11th Fine Jewelry and Timepieces and Studio Jewelry auctions, and December 14th Art of the American West and Turn of the Century Design auctions.